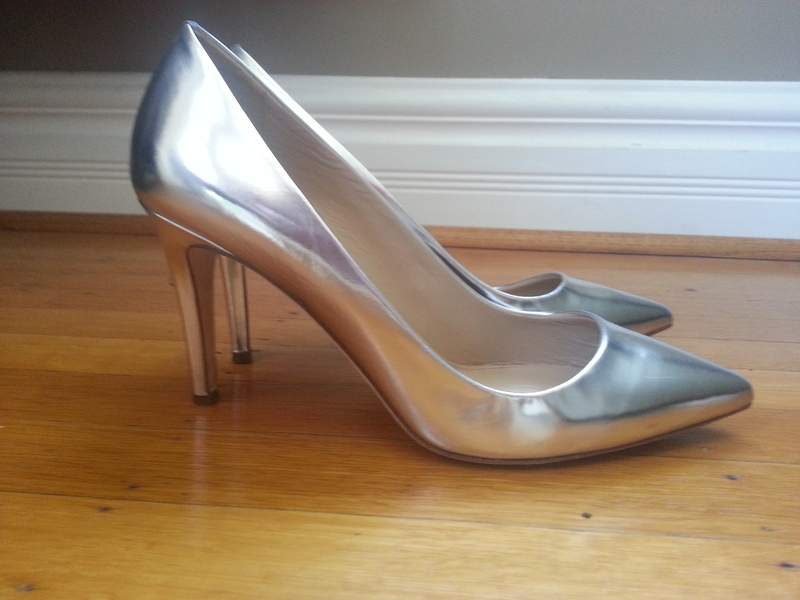 I was lucky enough to find the J.Crew Everly Mirror Metallic Pumps in silver on eBay last week for 60% off their current retail price. They were advertised as worn once which I was ok with since the photos didn’t show any wear except for some scuffing on the bottom. I actually ended up making an offer on the shoes which was accepted, so was fairly pleased with my bargaining skills. I’ve been drooling over them for weeks now, but of course I didn’t start fixating on them until after I’d spent my summer rewards and J.Crew was running cardholder promos. I went with my usual J.Crew shoe size (9.5) which is a half size up from my usual shoe size. I had seen reports that they were running small but I often find that when I go up an extra half size they’re too big. The shape of them looks weird from the top, maybe because I already stretched them out with my feet. The toe box on these is definitely small, and they’re a little snug on me but I’ll deal with it. The heel height feels the same as my leather Everlys which I find comfortable to walk in. As you can see, due to the small toe box there’s a fair amount of toe cleavage. I’m telling myself I’ll be ok with these but ask me again after I wear them for an entire evening. The mirror silver is definitely trendy but I plan on rocking them as long as I can. They are definitely an attractive shoe and I can see pairing this with a lot of things in my closet. I don’t know how much they’re going to stretch but I’m keeping my fingers crossed. It’s not worth the hassle of trying to track down a half size larger in these shoes (currently sold out online) only to find out they’d be too big. Which I definitely think they would be. 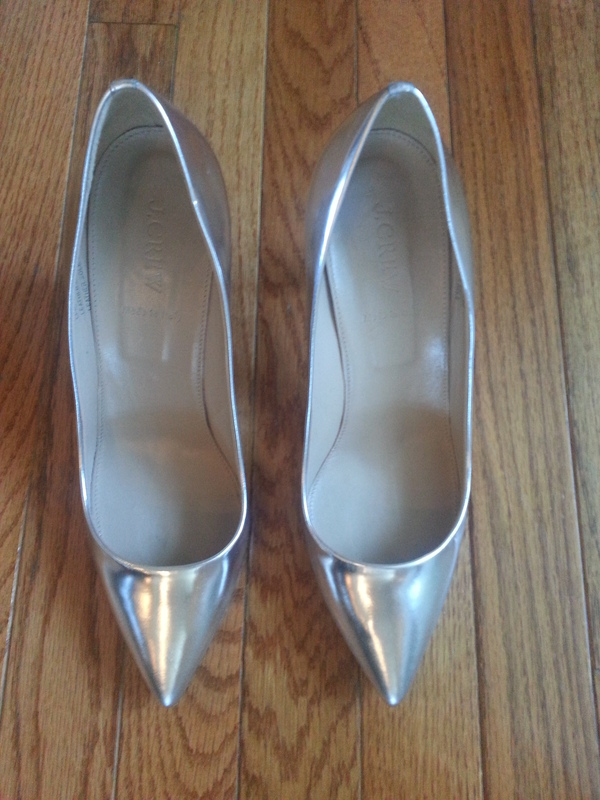 The silver finish seems substantial so hopefully they will keep and I will have to be very careful with the heels since that always seems to be the first part of my shoes that I destroy. And here’s a sneak peek of how I plan to style these shoes for an event I have in the near future. So, what do you think? Do you have these shoes or plan on getting them? Would love to hear what you think and thanks for visiting! It sounds like they mostly fit and you might not like the half size larger. It could get too long in the overall length. You need some shoe stretcher spray. You spray a little in the toe box and then put them on and wear them. They should conform more to your feet. I never put the spray on the sole. Just on the upper inside and sides of the shoe. Another option is to put the spray on and then put shoe stretchers in overnite. I’m a fan of trying the spray + wearing first. If I need more room, then I try the shoe stretchers. 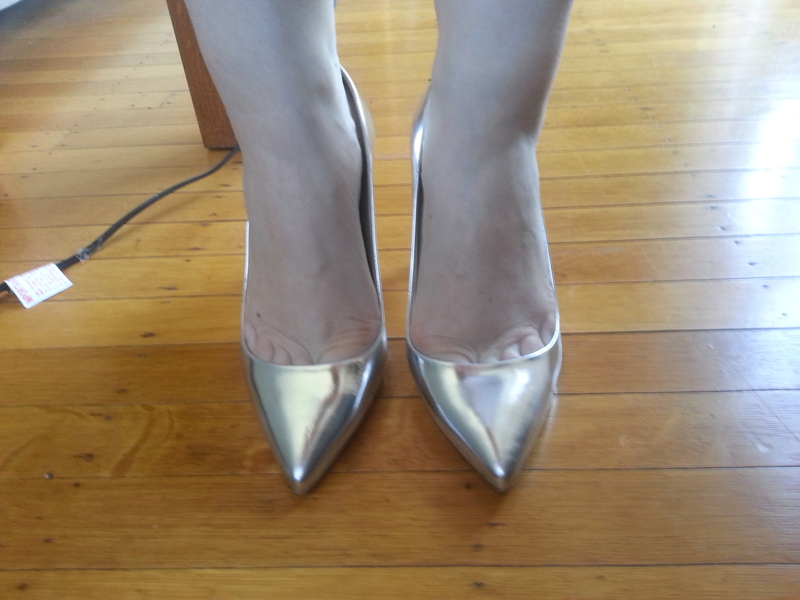 I love the mirrored shoes and ended up w/the Lillian mirrored metallics.